With concrete edging, one of the most innovative products in the landscaping industry, you can enjoy overwhelming beauty, reduced landscape maintenance, and increased home value. Considerably more durable and easier to maintain than plastic or metal landscape edging of the past, concrete edging will not rust, will not rot, and will not shift. Additionally, our concrete borders come in many different sizes, shapes and colors to complement any home. Our expertise in installing concrete edging ensures you have a continuous permanent weed barrier between your grass and landscaping or flower beds. There are no seams for weeds to grow through and some designs may even allow you to retire your weed-eater! Concrete Edging Only Looks Expensive! Don’t be fooled by the looks of our edging. Adding custom, decorative, concrete landscape edging to your yard or garden in Lake of the Ozarks, Springfield, Branson, Columbia, Jefferson City, Sedalia & Warrensburg, Missouri (or anywhere in between) is affordable. 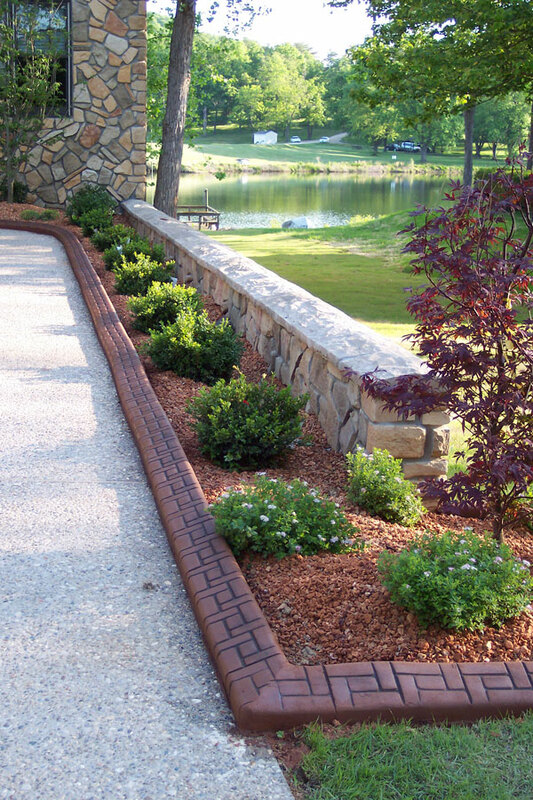 Decorative concrete borders bring instant curb appeal to any landscape. They complement but don’t overpower yards. They beautify any setting, permanently. Decorative concrete borders are a very cost-effective improvement. Decorative borders have proven to increase property values. And, they add distinction between beds, lawns, property lines, and other boundaries. Decorative concrete borders are appropriate for any climate or topography. They are available in a wide variety of styles and colors, with unique stamp patterns for any taste. They work for new yards or as a value-added improvement for current landscaping. Decorative concrete borders are permanent and maintenance free. They prevent erosion and preserve bedding material. They reduce the cost and time of maintaining beds and make edging much easier. Conveniently located in Central Missouri at Lake of the Ozarks, Border X’Pressions provides decorative custom concrete landscaping to yards and gardens in Lake Ozark, Osage Beach, Camdenton, Eldon, Springfield, Branson, Columbia, Jefferson City, Sedalia & Warrensburg, and other surrounding areas. 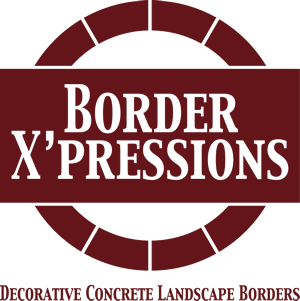 Border Xpressions is owned and operated by Jim and Kelli Case. Kelli is originally from Hermann, MO. She was raised on a farm, studied Business Ag at SFCC, and has a degree in Nursing. Kelli worked 17 years as a nurse with seven years as a surgical nurse for one of the “top 10 Surgeons ” in Missouri. She also holds a position as a nurse with the “ Laurie Care Center” and “the Knolls, Assisted Living Facility”. Both facilities are located in Laurie, here at the Lake of the Ozarks. Jim studied Machine Tool Technology at State Fair Community College and has worked for Gardner Denver Machinery and McDonnell Douglas. Jim has been with Union Pacific Railroad as a System Foreman for over 20 years. Jim lived in Sedalia most of his life. When they started Border Xpressions, it was a new venture in an old field for Jim and Kelli. 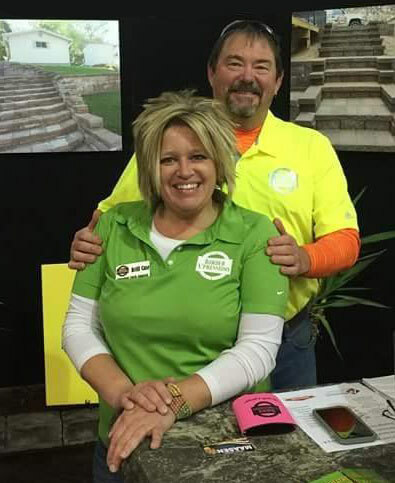 Landscaping had been a successful business for the two for over eight years. They then decided to concentrate on only the decorative concrete side of the home beautification process. Jim & Kelli believe their biggest attribute to anything they do is “precision” … both of their careers up to this point have demanded perfection and that is one thing they carry forward to our customers with Border Xpressions. No job is ever considered just “good enough.” It’s either done right to what is expected or not done at all. Jim and Kelli both are very proud of their community involvement. In April 2014, Kelli was appointed to The Lake West Chamber Of Commerce Board Of Directors, and both serve on The Lake Of The Ozarks Shootout Committee. The 2014 LOTO Shootout held a new event, The Border X’Pressions Lil Boat and Pontoon Poker Run, an idea brought to the table to help raise some more money for the various organizations and get a few more businesses involved with this great event. To date, in just five short years, their efforts have helped raise over $50,000 for different charity events right here at the Lake of the Ozarks. Jim and Kelli’s combined family includes 4 kids: Alysha, a Doctor of Pharmacology and SIUE Graduate, Dexter a Lineman for PAR Electric and Graduate of NLC, Denton TX. Cody an accomplished Welder/Farmer and SFCC Graduate and Kyle, coming into his Freshmen year in The Morgan County R2 School District.